Big or small, noisy or quiet, active or calm — choosing the right dog breed is important when you plan to be a pet owner in an assisted living community. Moving into assisted living does not mean you have to give up the benefits of furry companionship. With the increasing numbers of pet-friendly assisted living communities, which recognize the positive health outcomes that can be conferred by dog ownership, more seniors than ever are able to keep their longtime companions with them in the next stage of their lives. If you or a loved one is in assisted living and wants to own a dog, there are numerous breeds that are especially well suited to seniors and fit the pet requirements of senior communities. Research studies have repeatedly found that pet ownership has significant benefits for seniors’ mental, physical, and emotional health — in other words, pets are good for your body AND soul. Dogs in particular are great for providing physical exercise, socialization, and overall day-to-day companionship. Getting out for a daily walk, or even simply playing with a dog indoors, is an enjoyable form of activity, and seniors can choose a dog whose exercise demands are commensurate with their own needs and physical limitations. Even more profound, perhaps, than the fitness benefits of dog ownership are the enhancements to quality of life that a canine companion can provide. Pets can be downright therapeutic, promoting the flow of feel-good hormones in the brain and body, and thereby lowering stress, heart rate, and blood pressure. Over the long run, pet ownership has even been correlated with lower risks of heart disease, stroke, and depression. Breed: As we age, a large dog or a very active one might not be the right choice for us, especially if the dog owner has physical limitations that could cause safety concerns. Different breeds also have different requirements for grooming, different levels of trainability, and — particularly important for residents of a shared community — different levels of noisiness. Some breeds are also more susceptible to health issues. Age of the Dog: A senior dog often makes a great companion for a senior human — they may already be trained, and they are usually less active and demanding than a puppy. Another age-related consideration is a dog’s overall life expectancy; small dogs generally live longer than large ones. Temperament: The temperament of a dog (and how it meshes with the owner’s temperament) is extremely individual, even taking breed into account. Any potential dog owner will want to take the opportunity to interact and play with an animal before deciding if it’s a match made in dog heaven. Owner’s Medical Needs: Consider carefully your own physical limitations. If you have mobility issues, will this pose a problem for a dog that needs daily walks? Do you have oxygen tubing, which might present a playful puppy with the temptation to chew? Care Resources: What resources are available to help care for the dog, in the event the owner is not fully able to handle the responsibility? Can you afford to pay for grooming, veterinary visits, supplies, or pet sitting when you’re traveling? What resources are provided by the assisted living community? Do they have a Pet Care Coordinator? Community Requirements: Be sure to carefully check the regulations of the assisted living community regarding pets: many communities have size limitations (for instance, the Aegis of Kirkland welcomes pets under 25 pounds, while the Merrill Gardens at Tacoma welcome dogs up to 50 pounds). You might need to get your dog pre-approved, prove that it is house-trained, and/or provide a statement of veterinary health. We’ve scoured the web for advice from dog lovers and dog experts alike, and these 10 breeds that are consistently mentioned again and again as great choices for seniors — and, more importantly, they possess many of the traits necessary for a successful, happy life with their human companions in assisted living. Cocker Spaniels tend to be medium-sized (about 20 pounds) so they might not be suitable for every AL community, but they have enjoyed ongoing popularity as a breed with an even temperament — happy, affectionate, loyal, and charming. Bear in mind that they tend to be energetic, and also require a bit more grooming. If you live in a small assisted living apartment, why not consider one of the smallest dogs there is? Chihuahuas have a ton of personality for their size, and love being showered with affection; on the flip side, they are so loyal and protective that they might need a bit of training before dealing with children, and some Chihuahuas bark a lot. They can be active, but being small, they can often get sufficient exercise by playing indoors. Though Shih Tzu dogs might have a tendency to bark, they are also known for their friendly, playful, and alert nature. They are also small, which is ideal for apartment living; bred to be companions, with daily walks and indoor playtime, they tend to be healthy and long-lived, and enjoy sitting on their owner’s lap. Their long, luxurious coat does require a bit of time devoted to grooming, however. Though a Yorkshire Terrier (or Yorkie) has long hair that requires a lot of grooming, they are small and adaptable, making them a good option for assisted living. They’re intelligent, loyal, and lively, and usually get enough exercise with a daily walk. With a long history as companion animals, they enjoy daily interaction with their people; they can get a bit bossy, though, says the AKC. Another tiny dog that will easily fit within most communities’ size limitations, the Pomeranian is an intelligent little people-pleaser and (though, as a former Pom owner, I might be biased) one of the cutest dogs you’ll ever see. Being small and lightweight, they are easy to handle, and, though energetic, don’t require a lot of exercise as long as they get their allotment of attention. Besides regularly brushing their thick coat, their grooming needs are fairly straightforward. They can be a bit noisy, though. Of course, as any dog lover will tell you, every dog is an individual; so, while rule-of-thumb descriptions of specific breeds can serve as a useful guideline, being able to observe and interact with a specific pet before making a final decision will help you pinpoint the perfect dog with a personality that’s compatible with yours. Attention dog lovers: what do you think is the best dog breed for seniors in assisted living? We’d like to hear in the comments below. I’m suprised neither .the Lahsa Apso or the Maltese made the list. The Lasha Also only barks to alert in case of strangers or danger. They were the royal indoor guard dog for centuries in Tibet and another bonus is they are hypogenic. The Maltese is a happy go lucky very ancient dog breed from the island of Malta. They weigh around 6 pounds at most. Maltese love to sit in your lap, eat small amounts and are silky soft. They will bark to let you know someone is at your door. When people talk from experience they can open our eyes to things that we do not foresee! Thank you for this one. At 61 years old I have no idea how long I will live but to me 20 years even 10 is too long to have to live without an animal of your own if that is what you want! Perhaps this person has no idea that caps means yelling! If anything I believe it would have been much better taken and seen if you had just mentioned that in the internet World capital letters mean that you are yelling something! Cats are a good option!! Some of these dogs are very vocal and not good choice for community living. Some have a lot of health problems. There are better choices if you must have a dog …. more research perhaps? So true Freedom! Also, not every person is aware of that ridiculous rule that started with the chat rooms, and young punky kids, years ago. I didn’t hear shouting at all, and I’m pretty sure that you didn’t either Mr. James. I actually appreciated the caps, I could read everything easily, thank you. WHAT IS WRONG WITH SHOUTING. I AM 24 AND I LIKE TO SHOUT. DEAL WITH IT LES. SO TRUE, BECAUSE I DO IT! I Am 68 Yr Young! I would not recommend pugs as they do have a lot of health problems due to their pushed in faces among other issues. Now if you are wealthy senior I guess this might not be a problem but, it will be heartbreaking for an older person to get a pug, find out all the health issues they have and discover they can’t afford it. I say talk to your local vet about finding you a small dog breed or one up for adoption that will suit you best. Better still if you already have a good relationship with a vet that can help you out. I agree. My grandma lived in an assisted living place for a while and they didn’t allow her to keep her dog. She was miserable and eventually convinced us to move her back into her house. Her dog is with her again, and she is happy and content having caretakers help her in her home. Love l just read all the comments. Rescue dogs are too risky for the elderly. Small dogs ie all on this list are insanely protective barkers. Get a well bred senior Labrador or golden retriever. Even a senior German Shepherd would be better than a loud yappy little dog. I live in a “senior” community. The little dogs are loud and untrained and all rescues. So annoying …. Or a cat like springchicken suggests. Schnauzers bark and are annoying, cockers are well known biters, beagles are super high energy … unless they are senior dogs that have lived with the resident none of these will work. So how about the senior dog that the patient came in with ? Or get a senior lab from the pound. I BROKE MY ARM AND WRIST A COUPLE MONTHS AGO. PLEASE BE MORE CONSIDERATE OF THOSE OF US WHO CAN’T SEE WELL AND HAVE LIMITATIONS. Maybe you’re in the wrong assisted living facility. There are those which prohibit pets, which sounds like what would make you happy. As a 2nd gen dog person I can vouch for the fact that a weekly visit by a therapy dog who probably doesn’t have the time for a 1-on-1 doesn’t cut it. For some reason people seem to think small dogs for seniors are ideal, and small dogs tend to bark. I’d rather have a barky dog for a neighbor than a grouchy curmudgeon. My dad was a German Shepherd guy. Smaller isn’t always better for a senior. There’s no tripping over the small dog you didn’t see, no broken hips. That being said, there are mixed breed which look amazingly like German Shepherds. My brother found on tied to a parking meter & abandoned. I finally just gave up correcting the people who insisted he was a toy or mini-Shepherd. He was a sweet, obedient dog who had problems being left alone. He would sing until people came home. Fortunately my senior dad wasn’t absent from the house for long. The person who suggested looking at the dogs at online rescue sites was right. If you contact local rescue groups and explain what you’re looking for, they can bring contenders to the house for a meet-&-greet. Have you thought of fostering? You have no idea how long you will live. Twenty years or more is too long to live dogless. You will be doing a good thing, helping to socialize a dog who might have come from an owner who wanted a dog, but had no time, or really should have had a stuffed animal. You will have companionship and the satisfaction of knowing you helped a dog be ready for his/her forever home. Or, if the right forever home doesn’t happen, the rescue organization will once again take care of your dog if you no longer are able. There are also organizations which will, for a fee, take in your dog when you die and keep him/her until they either find a good home or until natural death occurs. These should be checked out in person. You also need to find out how financially solvent they are, if they have provisions for what happens to the pets in case the organization dissolves. There’s a book called “If I Should Die Before My Dog”, which covers planning. You could also be a pet sitter or doggie day care. I knew people who worked long hours and would pay through the nose for doggie day care. Especially if you only take in one or two dogs. If you decide to be a pet sitter, you don’t necessarily have to do it in their home. People would drop their dog off to your home and pick up the dog when they return. You can pick and choose your clients. There are options to being forced to live a dogless life, good luck! I’m looking at your list and it raises questions. All of the dogs on your list are in the small to tiny range. I’ve heard of seniors tripping over their dogs, getting tangled with the leash, falling and breaking a hip. Small dogs can be hard to see and can wind up being stepped on. Beagles needs lots of exercise and love to dig. Schnauzers are energetic and not the friendliest. Even the chihuahua owners admit that their dogs aren’t the friendliest. The last thing any senior needs is having their chihuahua bite the Meals on Wheels delivery person or the Home Health Aide. You could wind up as the house where support personnel don’t want to go. I would vote for a larger, senior dog. No problems with tripping over the dog, reduced exercise needs. My friend who lived with congestive heart failure had a Neapolitan Mastiff. It’s the only large dog at the Westminster Dog show which didn’t want to run around the ring & kept heading back to its place. It taught itself to crouch, waited for my friend to place the plastic bag underneath. Clean up was easy. Another plus is that people would think twice about breaking into a house with a 135 lb dog. Only downside is a wet mouth. Don’t discount mixed breed senior dogs. Often they are healthier than purebreds, as well as smart and loyal. A senior looking for a dog should contact local animal rescue organizations. Often their adoptable dogs are living with families as foster dogs. There they receive training and the foster family really knows the temperament and environmental needs of the dog. They are dedicated to making a good match between dog and person. Take ur grand pop dog shopping, pounds have websites so you can browse and see the dogs available. This way you can talk about the smaller dogs more suited for his needs an he may not warm up to the idea at first but after a few times looking at the pets he may see the “one”. Perhaps he is not shouting. Perhaps he types in caps so he can see what he is writing. Many people with failing eyesight type in caps for that reason. Gosh, our Justice system is [email protected]/(ed up! I have a question. Grandpa is an elderly man and is currently being treated for cancer. He is a stubborn man and only wants a German Shepard. I am his granddaughter. I am considering getting him a dog in the future because he is very grumpy and in-content with his life. He has had a dog in the past but I’m just not sure if this is right or wrong. A rescue dog himself who learned to walk again after losing mobility in all four limbs. The most patient dog I have ever owned! 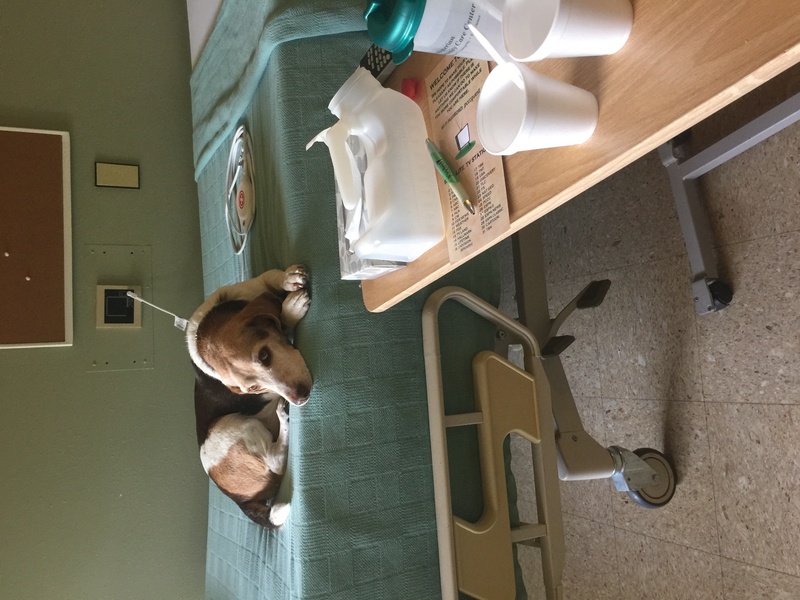 My very chill–and somewhat senior beagle hanging out in a rehab center with my 95 year old father in law. The dog missed his grandpa human too much; so he went for a visit! I have a yorkie-poo (yorkie and poodle). He is energetic some of the time, but he mostly just wants to lay down with you. He barks at new people, but once he knows them he just wants to see them not bark. I’ve met a good number (they’re the only dogs my aunt will get), and I’ve just never met a pleasant one. The first dachshund I ever met was aptly named “Bitey JoJo”. My neighbor has two, and they growl if you look at them, and try to bite you if you get near enough for a proper conversation with their owner. I could go on, but I wouldn’t want to bore you. Apparently you haven’t met the right dachshunds. I have been around dachshunds my whole life and none of them were aggressive. I have scars from those things! They’re so aggressive- are you insane? I’ve never met a nice dachshund. We have the best of them all. She is a combo of the Yorkie & the poodle, or Porkie because she is more Poodle than Yorkie. Dachshunds are great for seniors. I have owned three. They love to cuddle and are very loyal. They also have loads of personality. I do agree Brenda. We have adopted many senior poodles thru a poodle rescue group. What lovable companion dogs they have been. I have one that is 14 yrs. of age. I LOVE this dog. It must go with me toan independent living facility. I totally agree w/Robin. I used to operate ALFs nationally and the ‘little guys’ where much more difficult to deal w/ (e.g. very protective of their owners and wouln’t let caregiver in) and most were barkers. The geriatric pups were more quite. Our faciities limited the size to 15 lbs which I understood from a clean up standpoint. However, there were older goldern retrievers, and labs who were wonderful ALF residents. I’m a lover of all dogs – and would encourage potential residents to see if the facility will take in your critter based on it’s personality — as long as arrangements are made for the critters care. Thanks for this article. I don’t know why you wouldn’t lead this article with a mention of the many advantages of a mixed breed dog, as well as mentioning looking for a rescue dog in a shelter as opposed to going to a breeder (or should I say over-breeder) of purebred dogs mentioned in the article. Also, it’s a must to make arrangements in advance on finding someone who will take over caring for the dog if the owner passes before the dog does. I’d give my vote to a older, rescued cat that will love spending its days on a nice lap. I am disabled and live in assisted living. I do NOT recommend bringing a dog into the community. I say this from personal experience. Just about all of the breeds you mention are barkers. Many of the dogs who have lived where I do will bark at anything and everything. Annoying and/or frightening to many residents, especially those with mobility problems. I have seen residents in hysterics when an owner forgets/refuses to leash the animal. We do have therapy dogs visit at least weekly. If a resident must have an animal, a cat may be a better choice for all concerned. For all around comparability I don’t think and breed beats a Poodle. So smart they learn things almost as quickly as you can show then the trick/task or command. Poodles love people, generally get along well with other animals and love affection. Our Poodle is a standard and, when fully grown, she will weigh about 50 pounds.oodles are smell free, don’t shed ( they have hair not fur) and are close to being 100% hypoallergenic. Poodles are healthy dogs who have a great sense of humor, love fun but also adapt quickly to most situations because they are smart enough to figure out the game plan. They live to please their owners. Cats are great companions, especially if the person is not as mobile anymore. The cat doesn’t care … he or she just likes to hang out with his or her person (and cats, like dogs, have long lives these days). Most of my dogs have been mutts, and I would not overlook the precious mixed breed as an option (as someone else posted). I am not familiar with all the breeds but both Boston Terriers and Beagles, wonderful dogs that they are, can be very energetic and stubborn. If you are in a community, you may want to avoid a dog that is overly talkative as well. We adopted a tiny poodle for my mother toward the end of her life…the dog was on the senior side too and, was a perfect companion. She did, unfortunately, die before my mother. This absolutely crushed my mother and she would not adopt another animal and I truly believe my mom gave up some of her will to live when her little dog passed. There is no guarantee how long an animal will live…but it is good to be prepared for that eventuality, and how to deal with it. Because I have no family, I’ve determined that the dog and cat I share life with now will be my last…it would not be fair for me to adopt an animal now when I know it is likely that I don’t have many years left and no one to take care of the animals when I die. That is the other eventuality to prepare for…who will take care of the pet when the person is unable to take care of him or her? (just be sure no big health or litter issues going on). made all the difference as far as her well being is concerned. The director wasn’t sure about doing this, but when I insisted, she checked the rules and advocated for this. per service to go in weekly, do deeper cleaning, keep up with supplies, and report back to us via email on both L and her kitty. change out a litter box, get auto feeders/waterers….. I was very glad you mentioned adopting senior dogs (usually about 7+ years old), as they can be the perfect match for those who may be less active and looking for a calmer companion. Smaller dogs often live to 14 years or more. Also, the best breed may be no breed…a “mutt.” Mutts (usually shelter dogs) are less prone to health issues inherent in some purebreds, they are initially more affordable, and the feeling of saving a life cannot be beat!